The neuropeptide calcitonin gene-related peptide (CGRP) is a very potent vasodilator which plays a major role in migraine pathophysiology. CGRP and its receptors are currently being targeted for the development of new preventive therapies for migraine. 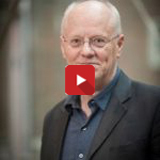 What is the evidence that CGRP plays a role in migraine pathophysiology? 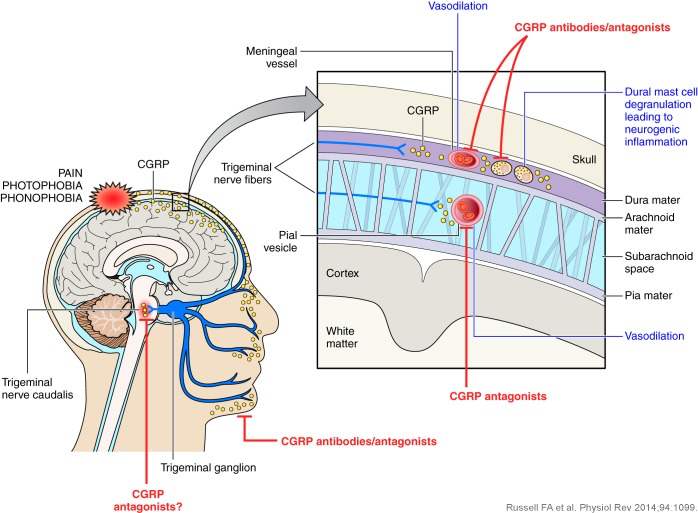 As CGRP seems integral to the clinical expression of migraine, CGRP blockade offers a possible strategy for the treatment of migraine. What approaches have been used to target CGRP or its receptor? A number of small molecule CGRP receptor blockers have been developed that show clinical efficacy in acute migraine. The first CGRP receptor blocker was called olcegepant. It was given intravenously and provided proof of concept that targeting CGRP was an effective migraine strategy. Although the drug showed clinical effectiveness in phase II trials, there were difficulties in producing an orally available formulation and so drug development was discontinued. The first orally available molecule of this class - the ‘gepants’- was called telcagepant but liver toxicity issues resulted in discontinuation. New oral gepants, including ubrogepant and rimegepant, are undergoing clinical trials. These have not shown liver toxicity to date. What is the potential for therapeutic monoclonal antibody therapy targeting CGRP or its receptor? Three monoclonal antibodies - erenumab [Aimovig], galcanezumab [Emgality], and fremanezumab [Ajovy] - are approved in a growing number of countries, for the preventive treatment of episodic or chronic migraine. A fourth monoclonal antibody (eptinezumab) is in development. Summaries of the clinical trial data are available here. Karzan N, Goadsby PJ. CGRP mechanism antagonists and migraine management. Curr Neurol Neurosci Rep 2015;15:25. Goadsby PJ, Edvinsson L, Ekman R. Vasocactive peptide release in the extracerebral circulation of humans during migraine headache. Ann Neurol 1990;28:183-187. Cernuda-Morollon E, Larrosa D, Ramon C, et al. Interictal increase of CGRP levels in peripheral blood as a biomarker for chronic migraine. Neurology 2013;81:1191-1196. Diener H-C, Charles A, Goadsby P, Holle D. New therapeutic approaches for the prevention and treatment of migraine. Lancet Neurol 2015;14:1010-1022. Membership is freely available to all healthcare professionals.